Marsyas, of De betooverde bron (Marsyas, or The Enchanted Spring) is the first of five music theatre works Diepenbrock wrote during the last ten years of his career. The eponymous comedy, a reworded rendition of an ancient Greek mythological story, was written by Balthazar Verhagen (1881-1950). However, the version of the text used at the performance of Marsyas of October and November 1910 bore Diepenbrock’s mark to such a great extent that he may well be regarded as a co-author. Verhagen was a civil servant at the ministry of Commerce and Industry. From 1903 to 1908 he had Latin and Greek lessons from Diepenbrock. Here he had learned about the myth of the amorous fight between the god Apollo and the satyr Marsyas, which Xenophon recounts in his Anabasis. Unlike in the original story in which Marsyas is skinned alive as a punishment for his hubris, in Verhagen’s libretto the satyr meets his death by drowning. Initially Diepenbrock did not get round to looking at the text, which he received at the end of November 1908. Most likely it was not until the next spring that Verhagen reminded his former teacher of it, requesting him to compose music for the comedy. On 24 April 1909 Diepenbrock wrote in a letter that he had enjoyed reading the first two acts. In July he gave Verhagen’s text to Willem Royaards, the director of the theatre company N.V. Het Tooneel, in order to get him interested in the project – so he told the author on a postcard that, as usual, was written in Latin. When Royaards announced at the end of the summer that he wanted to perform the play, Diepenbrock found inspiration and on 8 September 1909 he notated the first sketch of the Prologue. Until mid-February 1910 he was primarily busy writing and then orchestrating the piece. It was only after that, when most of the music had been written, that Diepenbrock wanted to modify the text. It becomes clear from Diepenbrock’s letters that this young lady, also a former pupil, was the true source of inspiration for his theatre music. This division was in fact carried out, as we can tell from the traces of the erasing knife Diepenbrock used in the piano score, resulting in Prologue (I) and Entr’acte (II), intended as an interlude between the first and second act. (Diepenbrock did not write any music for the first act of Verhagen’s comedy.) When completed, the Prologue (116 measures) and Entr’acte (184 measures) comprise almost half of the score; the Entr’acte is even longer than the overture for De vogels (The birds, RC 140) which Diepenbrock was to write in 1917. The rest of the work – two short melodramas (III, IV), the prologue to the third act (V) and an extensive finale (VI) consisting of Melodrama, Nymphendans and Apollo’s Epiloog (Melodrama, Dance of the Nymphs and Apollo’s Epilogue) – was written between the end of December 1909 and mid-February 1910. 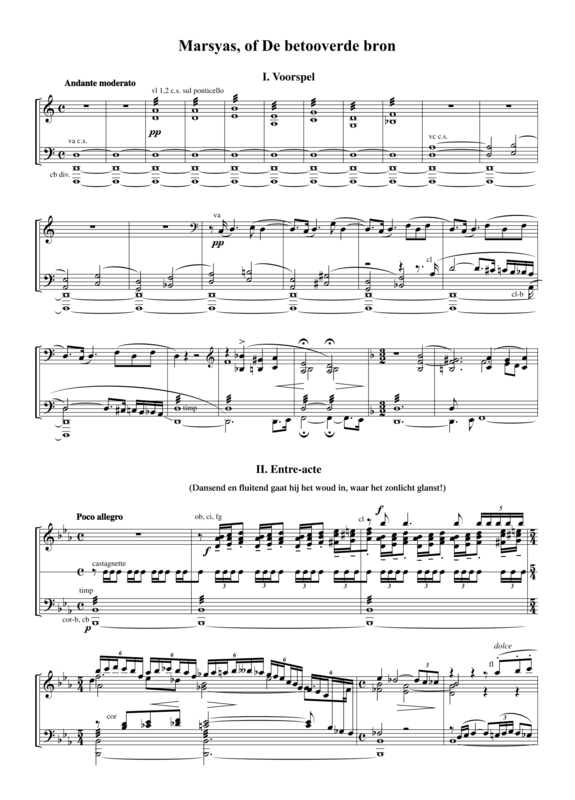 In the piano score that was completed on 17 February, only part III has text to it. The next day Diepenbrock asked Verhagen to add twenty more verses to the epilogue, so the king of the gods can announce that no heartening cathartic = purifying art can be created if ‘nature’ does not marry ‘culture’. (BD VI:228) Clearly Diepenbrock needed a closing ‘moral’. The Marsyas comedy has three main characters: besides the title role and Apollo there is the water nymph Deiopeia who they are fighting over. Each character has its own theme, while other motives represent more abstract concepts. In the Prologue (I), the Entr’acte (II) and the Finale (VI) these motives are set against a lush symphonic backdrop. In contrast, the accompaniment of the sections with text, which is spoken rather than sung (II, III and VI), is restrained. According to programme notes by Balthazar Verhagen, the Prologue (Andante moderato) is an evocation of a spring morning: the approach of the spring and thus the satyr Marsyas’ awakening from hibernation. (BD VII:532) The music rarely rises above pp, derives its dreamy, static character from a series of organ points. Possibly Diepenbrock was influenced by the impression of nature that opens Mahler’s First Symphony (Langsam. Schleppend. Wie ein Naturlaut). 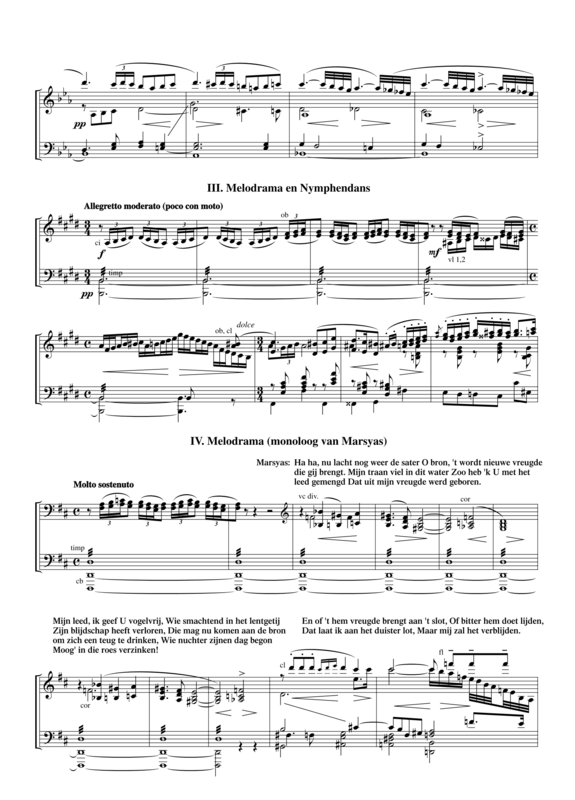 In the Prologue several motives are introduced, including – in the clarinet and the bass clarinet – a jolly upward leap followed by a quickly descending, chromatic line. The oboe and English horn play the sad motive bb–g#–a–e, which the composer earmarked as the actual motive for the spring: The water has got a soul through the tear of the faun. (BD VI:206) Linked to the satyrs and nymphs is a lively figure in the oboes, bassoons and castanets that precedes the entrance of Marsyas, representeded by a four-note motive with an upward leap of a perfect fourth. 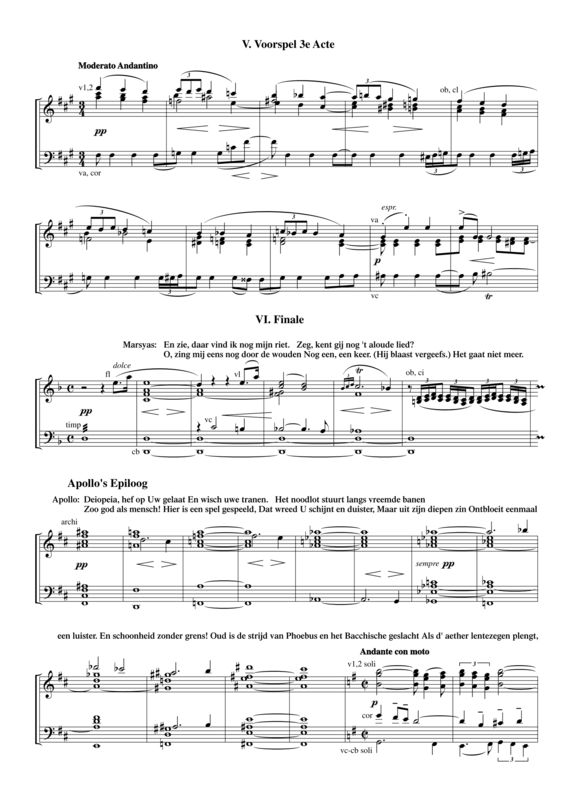 Finally, the Apollo theme (a monumental chord progression in the horns and harp), which is only alluded to in the Prologue, appears in its entirety in the Epilogue (VI). In Diepenbrock’s composition the harp represents the deity, while the satyr is personified by the flute, by analogy with the myth in which Apollo plays the kithara and Marsyas the aulos. The string instruments – which according to ancient Greek views, are at the top of the hierarchy – dominate the Entr’acte (II) in which a motive with a turn (presented con sordino in the violins and violas) forms the basis for a polyphonic texture that gradually unfolds and contains several canonic passages. Unlike the Prologue, this Entr’acte is rich in tempo and character changes within its overall development. A spun out Andante con moto (poco sostenuto) in b minor and a più mosso, poco agitato lead to the appearance of the nymph Deiopeia, with her cantabile theme in E major in the solo violin. At the end of part II there is a long monologue by Marsyas in which he challenges Apollo. The combination of speaking voice and music, which Diepenbrock uses here for the first time, was most likely suggested to him by Willem Royaards. At times the composer and the lyricist had serious doubts about the success of this joint project. In March 1910 Diepenbrock wrote to Verhagen that the comedy might work better without the music . (BD VI:242) As late as mid-July Verhagen in turn advised the composer to leave out the music of the Epilogue altogether: We should also bear in mind that the epilogue is already fairly long and it is drawn out even more by the music. (BD VI:333) Nevertheless, in the neat copy of the score, which was completed that month, Diepenbrock wrote next to the table of contents the optimistic words τῷ τέλει πίστιν φέρων – meaning: having faith in the end (a quote from Sophocles’ Electra). The premiere of Marsyas, of De betooverde bron in the Amsterdam Palace of Industry by N.V. Het Tooneel took place on 4 October 1910. This was followed by eleven more performances with Diepenbrock’s music: six repeats in Amsterdam and the others in Rotterdam, Arnhem, Leiden, The Hague and Haarlem. For this production Willem Royaards envisaged a comprehensive stage setting in the style of the famous German theatre director Max Reinhardt (1873-1943), with whom he had studied. R.N. Roland Holst (1868-1938) was recruited for the scenery and costumes. At Diepenbrock’s request, the rehearsals for the dances of the nymphs were entrusted to two pupils of the Swiss dance innovator Émile Jaques-Dalcroze (1865-1950). Diepenbrock himself conducted an ensemble consisting of thirty members of the Concertgebouw Orchestra. The fact that nearly all the critics thought that, at the end of the day, the music was the most valuable element of Marsyas, encouraged Diepenbrock to realise a concert performance by the Concertgebouw Orchestra. Already in February 1911 the composer conducted the orchestra twice in the Voor-, tussen- en naspelen uit Marsyas, of De betooverde bron (Prologues, Interludes and Postludes from Marsyas, or The Enchanted Spring), thus laying the basis for the orchestral suite, which has been performed regularly ever since and which was published in 1927. 1 The panel, which is most likely by Perugino, was acquired by the Louvre in 1883. See F. Haskell, ‘A Martyr of Attributionism: Morris Moore and the Louvre Apollo and Marsyas’, in Past and Present in Art and Taste. Selected Essays (New Haven: Yale U.P. 1987), 155-174. 2 E. Reeser, ‘Marsyas, of De betooverde bron’, programme notes in Ouverture 11/2 (1976), 33. 3 Afterwards Verhagen considered the text used in the performances of 1910 superseded. For the piano score that was published in 1922, he wrote an entirely new text for Apollo’s Epiloog. 4 Letter to Thea Diepenbrock d.d. 24-07-1945; see Ton Braas, Door het geweld van zijn verlangen. Een biografie van Matthijs Vermeulen (Amsterdam 1997), 40. 4 okt 1910: Eerste opvoering van Marsyas, of De betooverde bron, mythische comedie van Balthazar Verhagen met muziek van Alphons Diepenbrock door de N.V. “Het Tooneel” in het Paleis voor Volksvlijt te Amsterdam. Decor en kostuums ontworpen door R.N. Roland Holst, dansen ingestudeerd door de dames A. Beck en Marie Adema van Scheltema; het orkest bestaande uit 30 leden van het Concertgebouw-Orkest onder leiding van de componist. Regie: Willem Royaards. 't Schijnt gewenscht over het muzikale gedeelte van deze Mythische Komedie afzonderlijk te spreken. Dit is niet doenlijk. De muziek in dit werk is slechts illustratie. En toch zou het geheel veel minder indruk maken, indien het zonder deze illustratie ten tooneele gevoerd werd. Omgekeerd zou de muziek haar beteekenis geheel verliezen, indien zij van het comediespel gescheiden werd. — Welken indruk het geheel maakte, kan men hierboven lezen, maar toch kan ik niet nalaten even stil te staan bij den totaal-indruk. Er zijn groote geesten geweest die aangekondigd hebben, dat in het begin van de twintigste eeuw het menschelijk denken en voelen, en ook verder geheel het leven een vlucht omhoog zouden beginnen. Dan zou thans de tijd daarvoor gekomen zijn. Bij het zien en hooren van dit wond're comedie-spel kon ik niet nalaten steeds aan die wond're verkondiging te denken. Dit werk drijft het denken en voelen der ontvangenden in eene richting aan welke wij tot hiertoe niet gewoon waren. Als vanzelf wordt voor den hoorder en toeschouwer het voorgestelde als 't ware slechts een symbool, achter welk symbool de eigen fantasie een gewaarwording schept. En die in eigen binnenste ontstane gewaarwording is de eigenlijke beteekenis van het comedie-spel, dat ons stoffelijk oog op het tooneel heeft zien afspelen. In verband hiermede zijn er twee opmerkingen te maken en wel deze: ten eerste is het jammer dat bij een groot deel van het werk geen muzikale klanken gehoord worden; ten tweede mag men Apollo's zedepreek aan het einde van het werk als eene ontgoocheling beschouwen. — Wat de eerste opmerking betreft; mag men op den voorgrond stellen, dat de bedoeling van den dichter geweest is, te trachten zijn toeschouwers aan het gewone denken te ontrukken, om ze, zoo mogelijk, in eene soort van extatischen toestand te plaatsen. Indien nu muzikale klanken den invloed van het woord komen versterken, dan moeten zij onafgebroken hun mystieken invloed blijven oefenen. Niet altoos behoeft de componist pogingen te doen bij de scène op 't tooneel een passend stukje muziek te schrijven, het uithouden van een enkelen toon, een tremolo met lage clarinettonen (zie finale tweede bedrijf Freischütz), of iets van dien aard is voldoende; de muzikale klank moet ons oor blijven vullen. In deze muziek is 't zuiver en alleen om het klankeffect te doen. Zelfs de mogelijkheid van een logischen muzikalen opbouw is buitengesloten. Zoodra nu de muziek ophoudt ontbreekt voor een deel de betoovering onder welke de ziel van den hoorder gekomen was. Voor 't overige schijnt 't mij als zou Diepenbrock er op geniale wijze in geslaagd zijn dit fijne, ideaal gevoelde werk met klanken te omhullen. Ik zou zelfs nog een stap verder willen gaan en verklaren, dat eerst in dit werk Diepenbrock de plaats gevonden heeft waar zijn zeer eigenaardige muzikale kunst tot volle ontwikkeling zal kunnen komen. Deze, zijne kunst, toch wordt niet geschraagd door een vasten zuiver muzikalen ondergrond, zooals dit bij Bach of Beethoven het geval is; hij geeft eenvoudig zijne zielsstemmingen weer, zooals zij in zijn binnenste opwellen, onbekommerd om den bouw. Gesteund door den bouw van het drama, kan dit vrije, phantasieachtige geen gevaar opleveren. En zoo genoten wij volop van de verrassend schoone klanken, die, evenals de woorden en nog meer de betooverende kleuren-harmonieën, onze ziel deden ontwaken, scheppend beelden in haar die niet van deze wereld zijn. — Zeker zullen wij dit wond're spel nog menigmaal gaan zien, misschien zal er aanleiding zijn nogmaals er over te spreken, nu echter reeds mag men verklaren, dat het opvoeren van dit werk een daad van groote beteekenis is en niet voor het schouwspellievend publiek alléén.